Do Organic Growers Use ‘Hazmat’ Suits? I came across this image the other day. A farmer spraying his field wearing a protective suit and face respirator. When I see this, I see a farmer keeping himself and those around him safe. When activists look at this, they seem to see a scary hazmat suit and chemical poisoning. 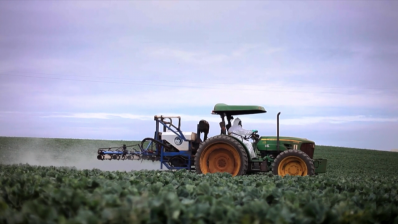 The beauty of this photo, is that it was taken from a video about an organic cauliflower grower in California. This farmer is spraying a “natural soap spray”. Obviously, this spray poses some danger to the tractor operator, or he wouldn’t be using this Personal Protective Equipment (PPE). Compliments are in order to this business for instituting safe handling practices. Round-Up Pro – Wear regular clothing that covers your skin. Green Light Neem Concentrate – Labeled for Organic Production. Fungicide and Insecticide. No PPE listed. Des-X Insecticidal Soap Concentrate – Labeled for Organic Production. Toxic to Bees. Requires protective eyewear, coveralls, and chemical resistant footwear, gloves, headgear and apron. Clorox Regular Bleach – Wear safety goggles and rubber gloves. 99% of you probably have this in your laundry room. Lorsban 4E – Pesticides with this label will likely be Restricted Use Pesticides (RUP) and will require an applicators license to purchase and apply the product. Note the only thing unusual in terms of PPE for this product is a need for chemical resistant gloves. Only the person mixing this needs to use any kind of respirator. What we see in these examples is that a chemical with a signal word of “Warning”, that is labeled for organic production, requires far more Personal Protective Equipment than one with a signal word of Danger/Poison. This doesn’t mean that the Lorsban 4E is safer, just that it has different requirements in PPE for the applicator. Almost all farmers use pesticides, and it’s likely that they will at some point need some form of protective equipment – organic and conventional growers alike. Tags: Bleach, Caution, Danger, EPA, farming, Insecticidal Soaps, National Pesticide Information Center, Natural Soap Spray, organic, Organic Growing, Organic Production, Personal Protective Equipment, Pesticides, PPE, Signal Words, Warning. Bookmark the permalink.